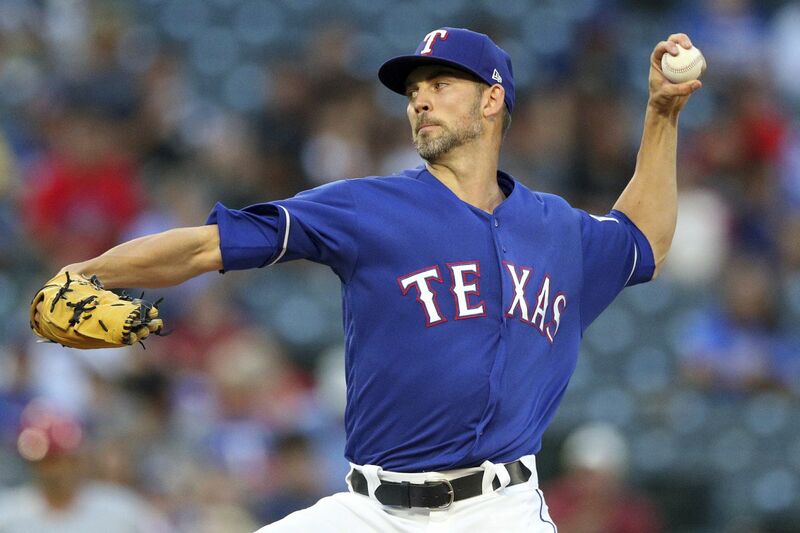 Texas Rangers lefty Mike Minor has emerged as a possible trade target for the Phillies. More than once over the past few weeks, Matt Klentak has taken aim at the Manny Machado and Bryce Harper camps by saying the Phillies “won’t be held hostage by one or two players” in pursuit of other offseason business. Swell. But that won’t make Machado and Harper — or their rival agents, Dan Lozano and Scott Boras — move faster. Odds are, the wait for the free-agent megastars to choose their next teams will drag on through Christmas and New Year’s. But there is one area where the Phillies can pounce. They continue to focus on ways to improve their pitching staff, according to multiple sources, with two sources indicating that they are pursuing a trade for Texas Rangers lefty swingman Mike Minor. It’s likely the Phillies view Minor as a starter, even though he had his best season in a relief role for the Kansas City Royals in 2017. He was a starter early in his career with the Atlanta Braves and returned to the rotation last season with the Rangers. In 157 innings over 25 starts, he had a 4.18 ERA and only 7.6 strikeouts per nine innings. Klentak and manager Gabe Kapler have expressed their desire to add a lefty to a rotation that has been almost entirely right-handed over the past two seasons. They made a five-year offer to free-agent prize Patrick Corbin but were outbid by the Washington Nationals. And they drew a line at two years for free agent J.A. Happ, who signed this week with the New York Yankees. Minor, who turns 31 next week, is under contract through the 2020 season. He’s due to make $9.83 million in each of the next two years, part of a three-year, $28 million deal that he signed with the Rangers last winter. The Phillies looked into acquiring Minor before the trade deadline in July but decided against upgrading their rotation. If the Phillies are looking at Minor as a starter, they could remain engaged with free-agent lefties Andrew Miller and Zach Britton, who have risen to the top of their wish list in recent weeks. Miller, in particular, seems close to signing. When the winter meetings began on Monday, a source said Miller was expecting to sign “sooner than later.” And now that the New York Mets and Los Angeles Dodgers have reached agreements with Jeurys Familia and Joe Kelly, respectively, the reliever market might be poised to move — and fast. The Phillies have made a strong push for Miller, who might be the best possible fit for their bullpen. In addition to being a left-handed option to offset righties Seranthony Dominguez, Hector Neris, Pat Neshek and Tommy Hunter, Miller has been a closer, set-up man, lefty specialist, long reliever and even a starter during his career. At age 33, Miller has “no concern or preference about roles,” according to one source, an attitude that figures to appeal to Phillies manager Gabe Kapler, who deploys his relievers based on situations rather than assigning them specific innings. But Miller likely is seeking at least a three-year deal. He dealt with shoulder and knee issues that limited him to 34 innings last season. He’s also coming off his worst season since becoming a full-time reliever in 2012. In 37 appearances, he posted a 4.24 ERA and averaged 4.2 walks and 11.9 strikeouts per nine innings. Over the previous four seasons, he had a 1.72 ERA, 2.3 walks and 14.5 strikeouts per nine innings. But there’s reason to believe Miller is healthy after reportedly being cleared at the Hospital for Special Surgery in New York by David Altchek, the Mets' team physician. The Phillies have also been linked to Britton and for good reason. They tried to acquire him from the Baltimore Orioles before the trade deadline in July. He was dealt to the New York Yankees instead and finished the season with a 3.10 ERA, 4.6 walks and 7.5 strikeouts per nine innings, proving he had recovered from a torn Achilles. Britton has a long relationship with several members of the Phillies' front office, including Klentak and team president Andy MacPhail, from their days in Baltimore. Assistant general manager Ned Rice even gave Britton a lift to the airport in 2006 after he signed his first pro contract.